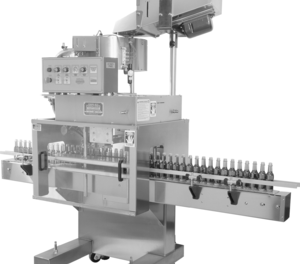 Fully automatic Combination Capper / Over Capping / Lidding Machine requires only 32" of line space. Handles screw caps of all materials and styles from 13mm to 70mm including pilfer evident and child resistant cap closures over caps, lids and fitments of all materials and styles from 13mm to 70mm. Portability allows versatility for automatic over capping / lidding; easily moved from one production line to another. Handles metal, glass, or plastic containers from low jars and vials up to 2-1/2 gallons. Comes with a standard rotary cap feeder. Stainless steel 7’6” conveyor frame DC variable speed drive with a 4 1/2” wide Delrin chain with stainless steel pins, stainless steel drive and idler shafts with reinforced nylon conveyor rail posts, stainless steel conveyor end guards and non-corrosive drive and idler conveyor top chain sprocket. (left to right travel standard) Note: (Machine also can be purchased without conveyor). Patented stainless steel adjustable upper and lower cap chutes to handle from 13mm to 70mm standard flat CT caps. Calibrated settings allow for ease and repeatability of changeover. Stainless steel 3.5 cubic foot upright cap supply hopper (pre-feeder). Heavy duty patented multiple disc adjustable torque clutches which give a consistent torque and minimize wear on cap tightening discs (one pair). All electronically controlled variable speed drives for ease of adjustment. Mounting facilities for using a second set of bottle gripper belts. All rotary cap feeders have stainless steel and FDA approved materials for all contact parts. No bottle/no cap release from chute. - Caps of all materials from 8mm-70mm.